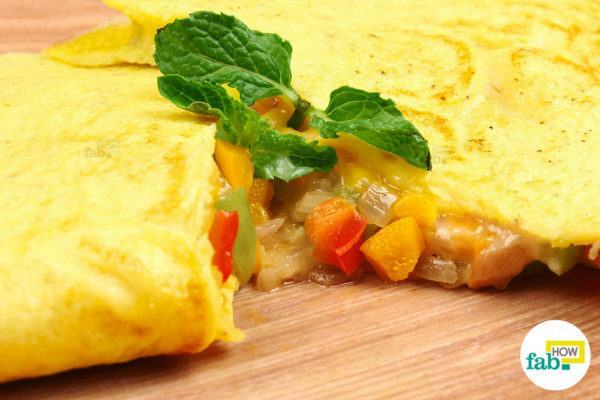 Omelets are a quite popular meal around the globe. Soft and custardy or crunchy and brown, it is a choice breakfast for many. However, when it comes to making an omelet, the logistics of it downright scares a lot of people. Omelets are very versatile. You can either have them plain with good old salt and pepper or incorporate a variety of meats, vegetables and even seafood. 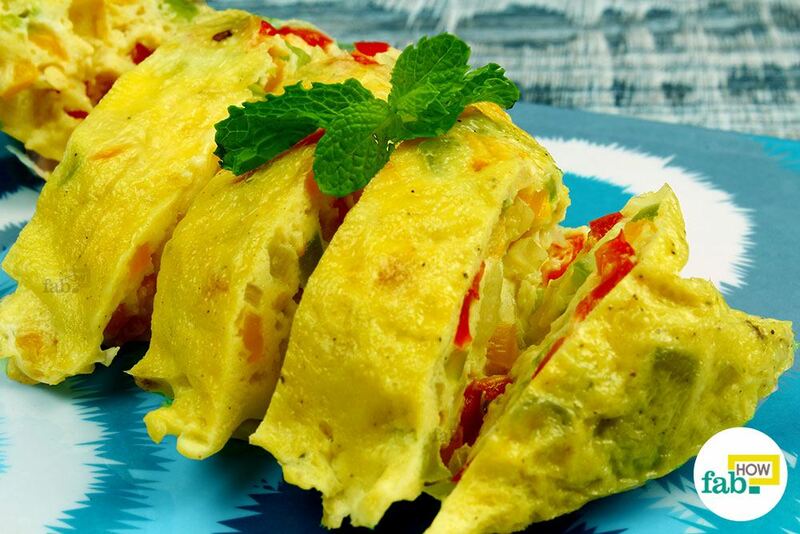 Omelets are one of the healthiest breakfasts around. They are packed with protein and other nutrients that give you a good start for the day. They taste best straight out of the pan and piping hot. 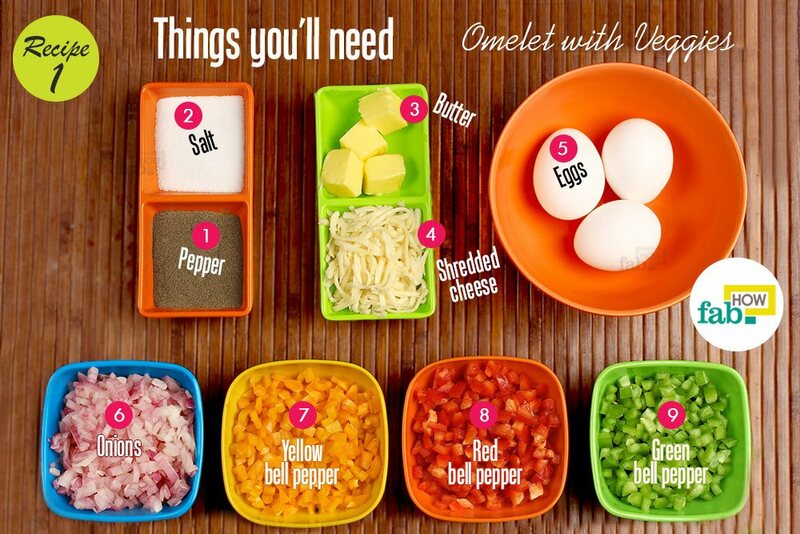 By learning how to make omelets, you can easily satisfy your omelet craving at your own convenience. Chances are your initial attempts may crash and burn to say the least, but you’ll notice definite improvement with each try. So keep your chin up while you’re at it, and you’ll surely end up with some good omelets as a result. 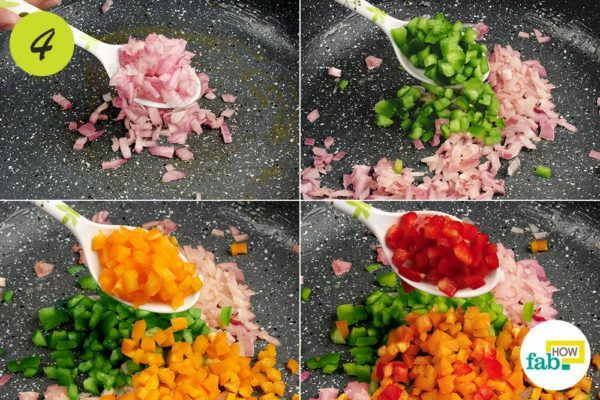 Here's a step-by-step guide to make a perfect omelet that you can choose from depending upon your mood and culinary skills. One by one, break 3 eggs over a bowl. 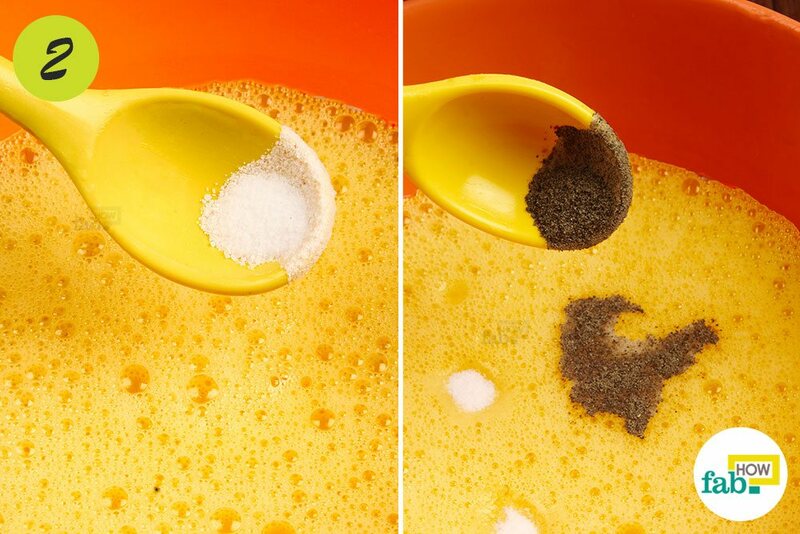 Drain the whole contents of the eggs into the bowl. If some bits of shell end up in the mix, pick them out. 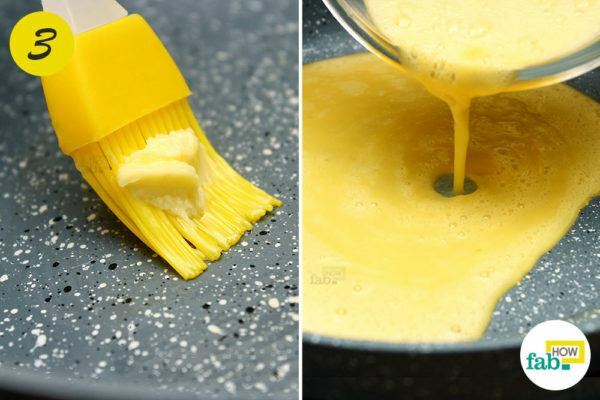 Whisk the eggs completely. 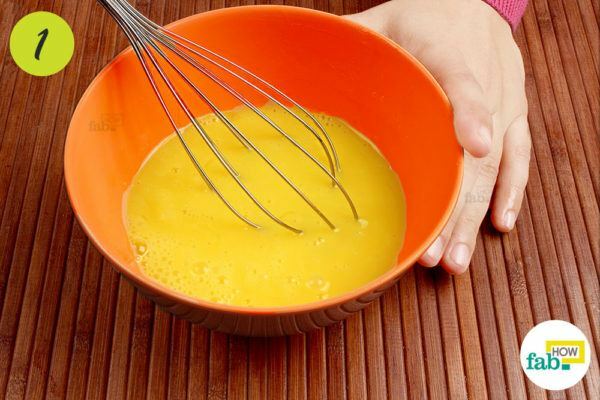 Thorough whisking is a must for scoring success with omelets. So, whisk your eggs until they become a nice homogeneous mixture and you can’t spot any yellow and white strands. Place a non-stick skillet on medium heat. 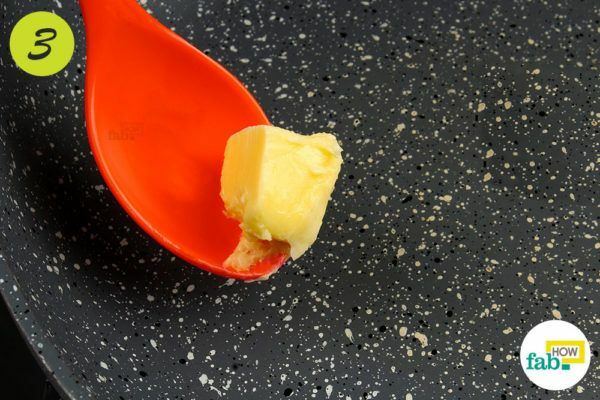 Brush some butter over the skillet and let it melt. When the butter starts foaming, your pan is ready for the eggs. Pour the eggs into the skillet, spreading them evenly over the surface. The eggs should sizzle on contact with the skillet. If this doesn't happen, make your skillet hotter in the next attempt. The cooking time can vary according to individual preferences. Some like their omelets underdone, some like to brown the bottom slightly. Wait for the bottom to get cooked. It will begin to set and firm up with no visible liquid floating around. This usually takes about 1 to 3 minutes, depending upon the heat and the type of skillet you use. Fold the omelet when it is firm and cooked, but still looks a bit wet. The eggs will continue to cook in the residual heat and will be perfectly textured by the time they reach your plate. 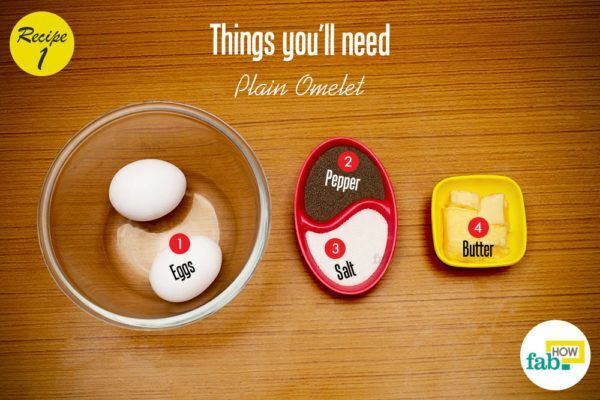 Transfer the omelet to a plate and enjoy a nutritious meal. You can also make it part of a healthy breakfast spread and have it with fresh fruit, yogurt or your favorite smoothie. One by one, break 3 eggs over a bowl. Whisk the 3 whole eggs thoroughly. 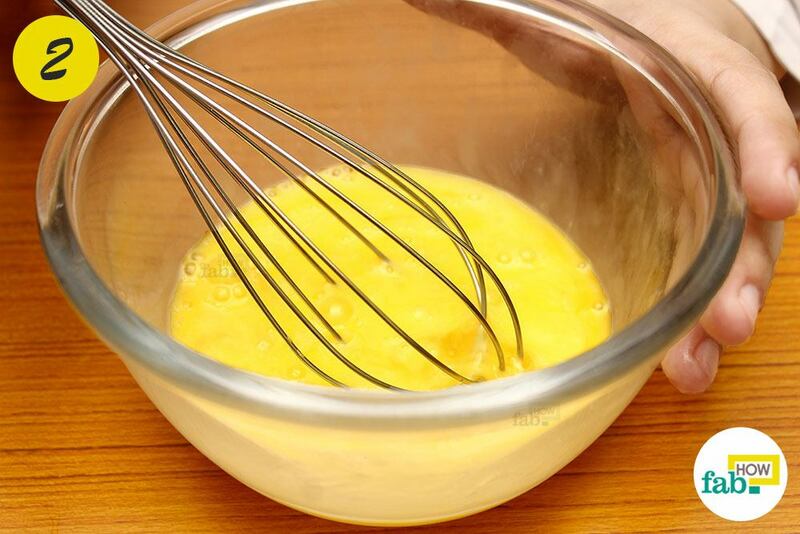 Use a hand blender if you must, but be sure to whisk the eggs into a homogeneous mixture. 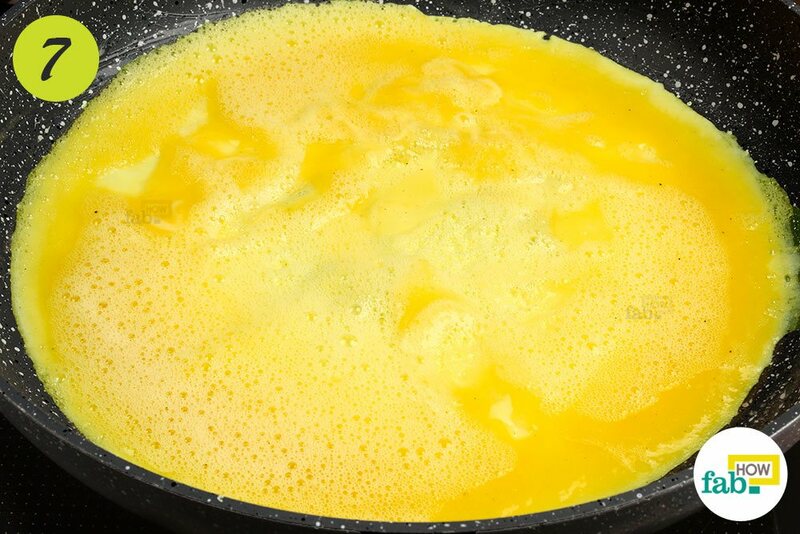 Any strands of white and yellow will interfere with the texture of the omelet. Add salt and pepper to the eggs. Seasoning should be determined as per your preference. Any additional seasoning, if preferred, should be added at this point. Put a knob of butter in a non-stick skillet placed on medium high heat. Add 3 tablespoons of chopped onions to the skillet. The vigor of onions forms the base of a veggie omelet. 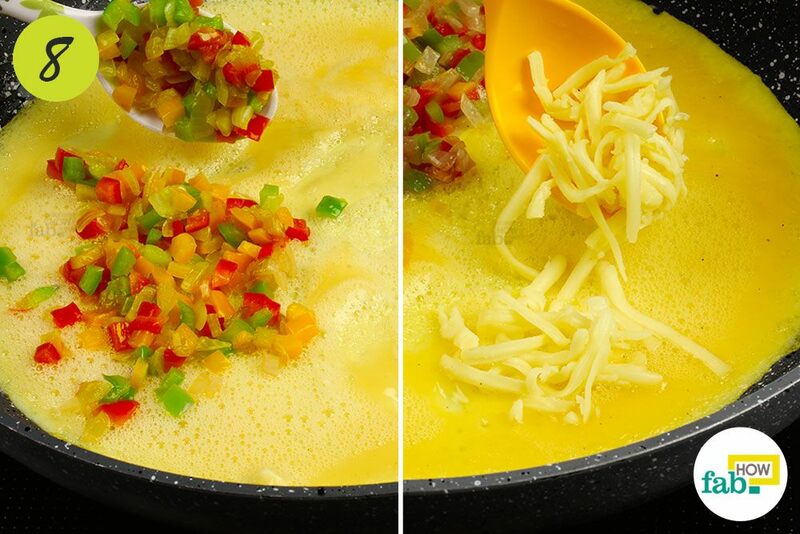 Put 3 tablespoons each of chopped green, yellow and red bell peppers in the skillet. The size of the chopped peppers should be from medium to small. 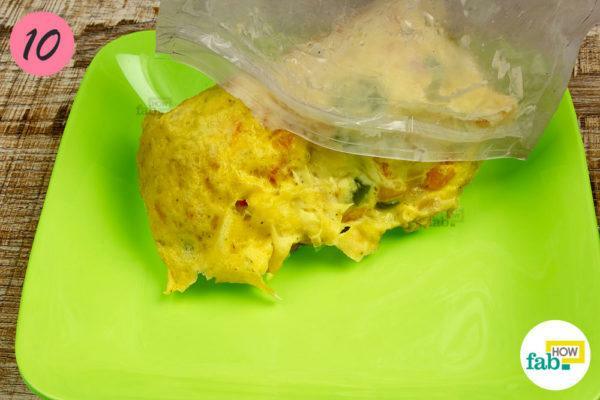 Large chunks of filling become too heavy for the omelet and may result in its tearing. 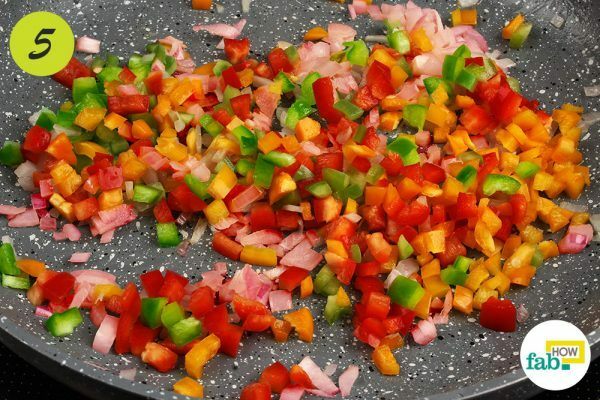 The different colored bell peppers give your omelet a vibrant color and add a crunch to it. Keep the heat at medium high and sauté the vegetables for 2 to 3 minutes, depending on your preference. Always remember to cook the filling ingredients like tough veggies and meat, especially meat. While bell peppers can also be enjoyed a bit crunchy, ingredients like mushrooms or broccoli need more cooking before being used in an omelet. Wipe the pan clean and brush the non-stick skillet with butter. 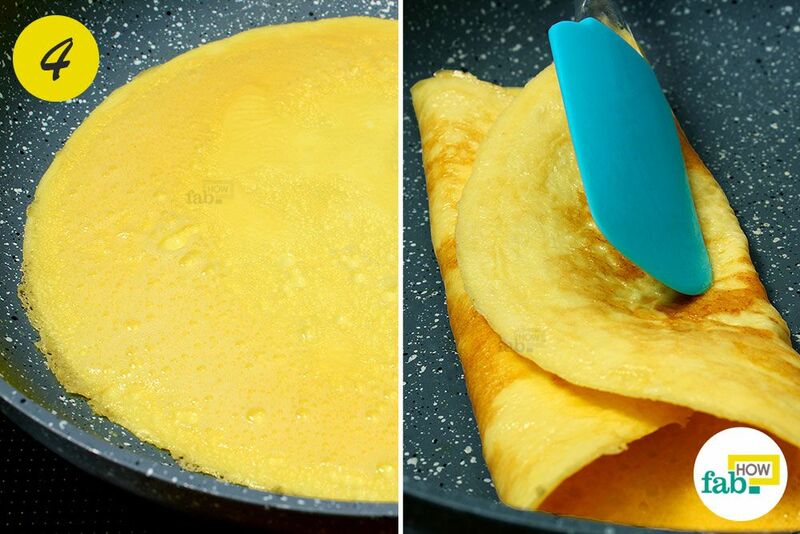 Unless you’re a pro at making omelets, using a non-stick skillet will improve your chances for a success. When the butter starts bubbling, pour the eggs into the skillet. Spread the eggs evenly across the surface. If the froth in your egg batter died while you sautéed the vegetables, give it a couple more strokes before pouring it into the skillet. Let the eggs set. The bottom should take about 2 minutes to become firm, if still a little underdone. Any filling is to be added after this point. If you add the filling before the bottom firms up, the filling will tear your omelet immediately and go right through it. From the point you pour the eggs into the skillet, you need to be fast and vigilant. Add the sautéed vegetables to one-half of the omelet and shredded cheese to the other half, as soon as the bottom becomes firm. You can use different cheeses in your omelet to complement the vegetables you use. Now, give your omelet some quiet cooking time by covering the skillet with a lid and letting it sit for about 2 minutes over medium heat. In the last 2 minutes, your omelet will have gotten perfectly done and the cheese deliciously melted. 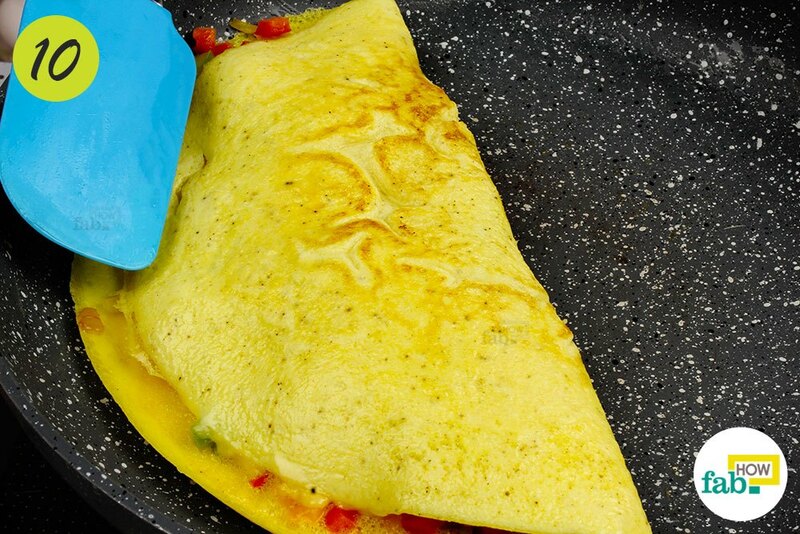 Fold the omelet carefully with a spatula and gently lift it onto a plate. Garnish with a sprig of fresh mint leaves and serve the omelet while it’s hot. 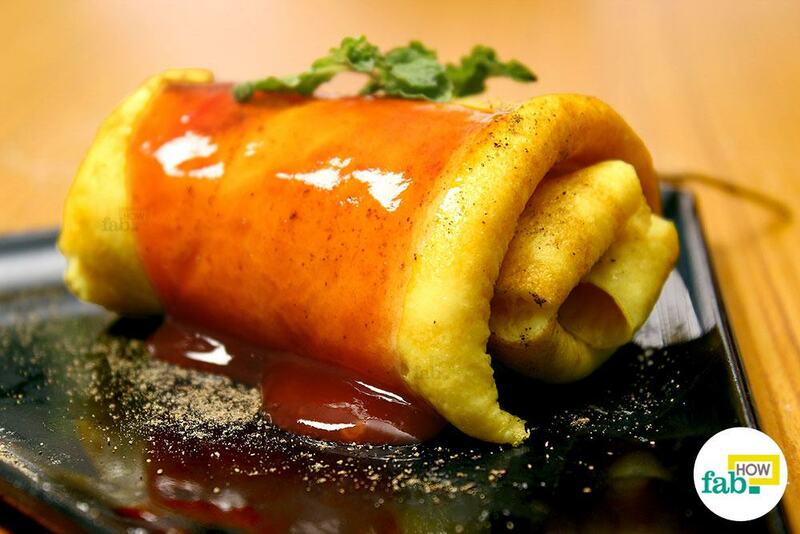 Depending on what you use for the filling, this omelet can also be served as lunch. 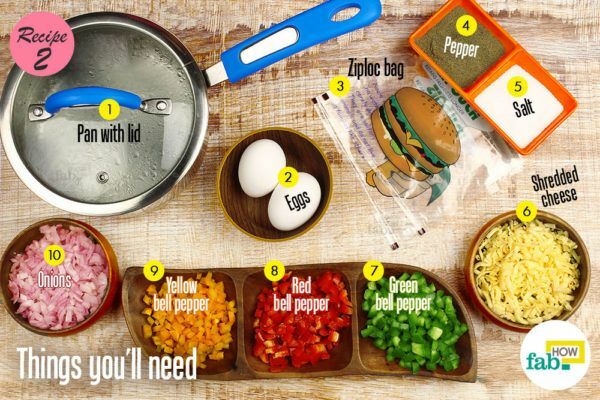 If after putting in all the efforts you still haven’t mastered making the omelet, it’s time to do it the hassle-free way. This no-fuss, no-muss Ziploc bag omelet is healthy as well, considering that it doesn't involve any frying. 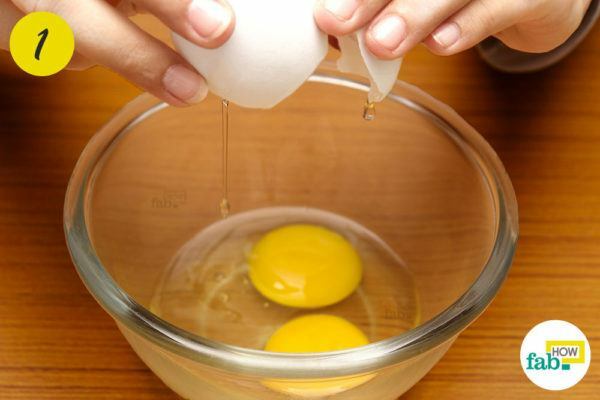 Start by breaking an egg into a bowl. Be sure to pick out any stray bits of shell that drop in. Pour the entire contents of the bowl into a Ziploc bag. Squeeze the air out and seal the bag. 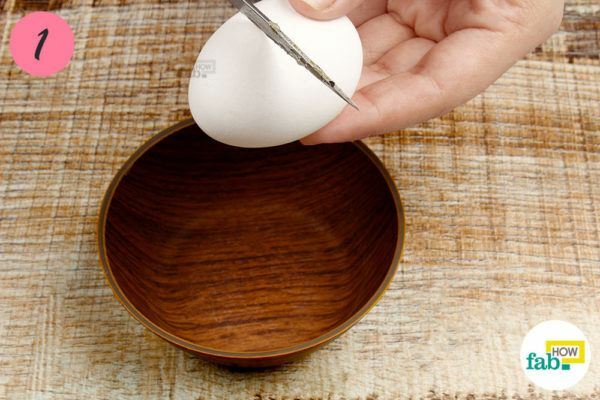 Break up the yolk between your thumb and fingers. Beat the egg thoroughly this way. Squeeze and shake the bag to help you along. 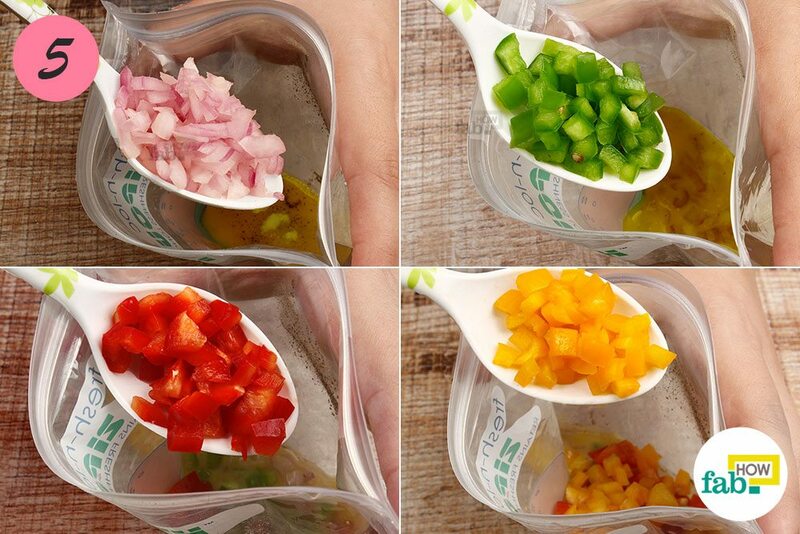 Add salt and pepper to the Ziploc bag, as per your taste. Any additional seasoning should also be added at this point. 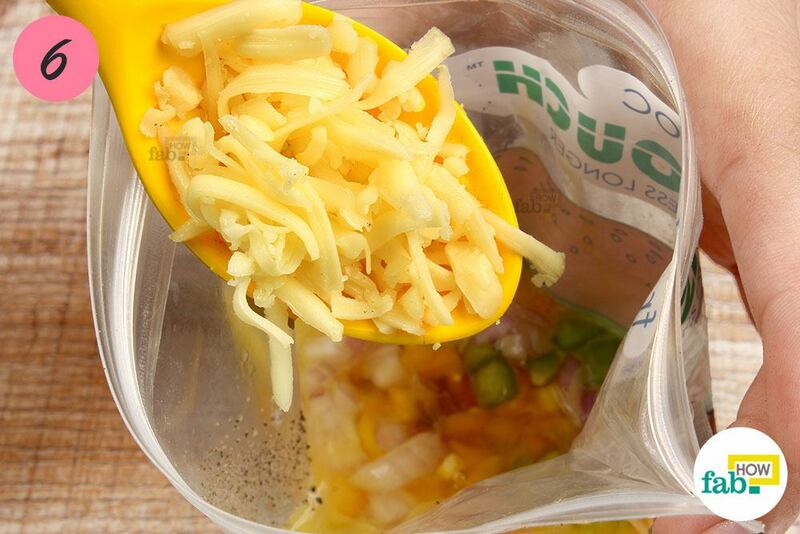 Add 1½ tablespoons of chopped onions to the bag. Add 1 tablespoon each of green, red and yellow bell peppers as well. Be sure to keep the quantity of the veggies proportionate to the eggs. Finally, add 1 tablespoon of your favorite shredded cheese to the bag. 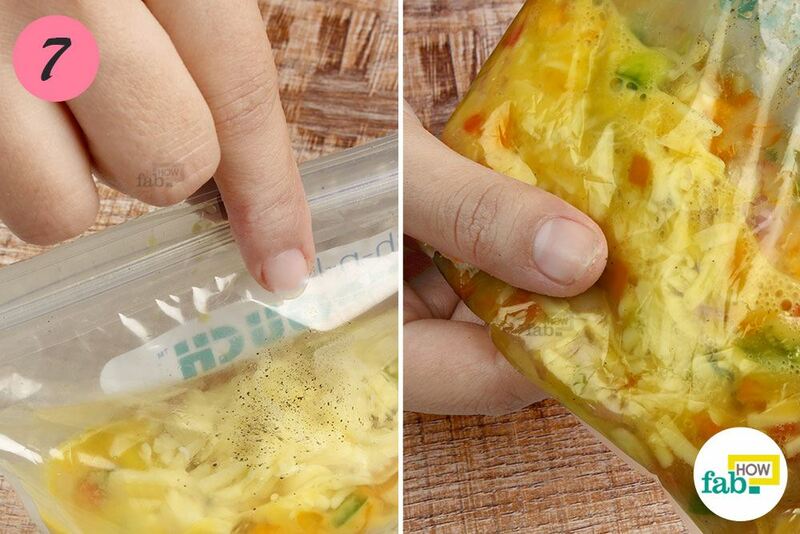 Seal the Ziploc bag. Be sure to drive all the air out before sealing it. 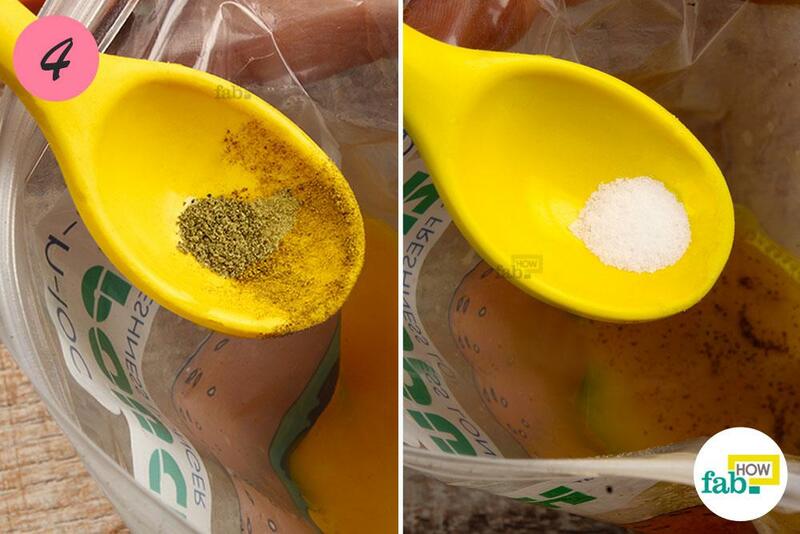 Now, mix the contents of the bag thoroughly by working the bag between your fingers. Set water in a pan to boil. The water should be enough to fully submerge the Ziploc bag. You can also start the water before you start mixing the ingredients. Put the Ziploc bag into the boiling water. If making for a crowd, put all the Ziploc bags into the boiling water. 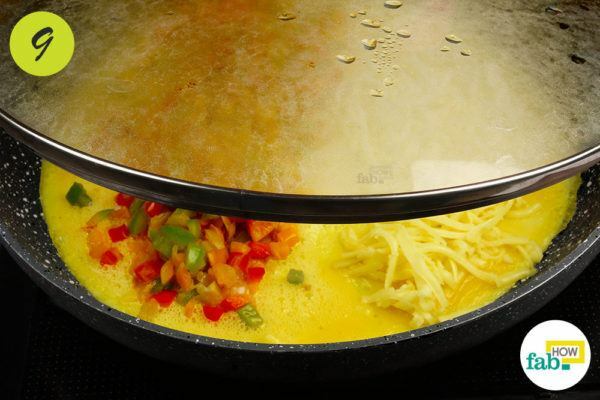 Use a bigger pan and increase the amount of water in that case. Boil the bag for just about 13 minutes. That’s all the time you need to make this omelet. 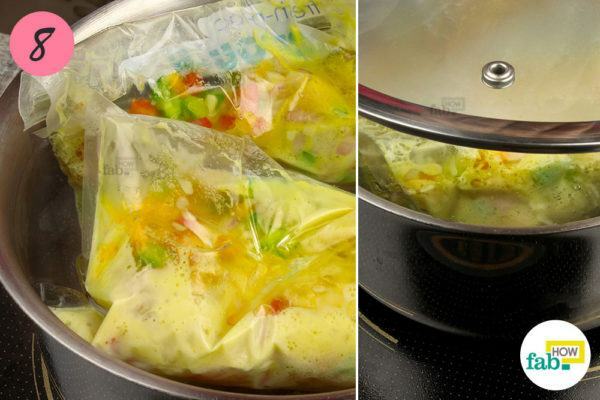 After the allotted cooking time, take the bag out of the boiling water using a pair of tongs. Know that after 13 minutes or so of boiling time, the bags are bound to be scalding hot. To prevent any mishap, use caution while picking the bags out of the water. 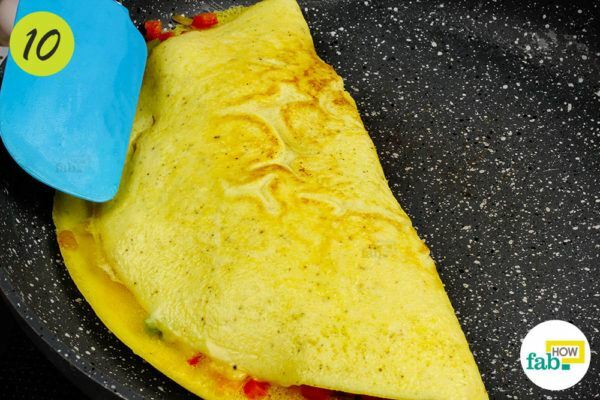 Carefully open the sealed bag and let the omelet slide out onto a plate. Voila! Enjoy this easy omelet you made without much hassle. This omelet is cooked essentially by boiling, so it’s healthier than pan-fried omelets. You’ll see that the egg has set around the vegetables, covering them completely. Make 2 of these to complete 1 serving. Garnish with a sprig of fresh herb if desired, and serve your omelet hot. 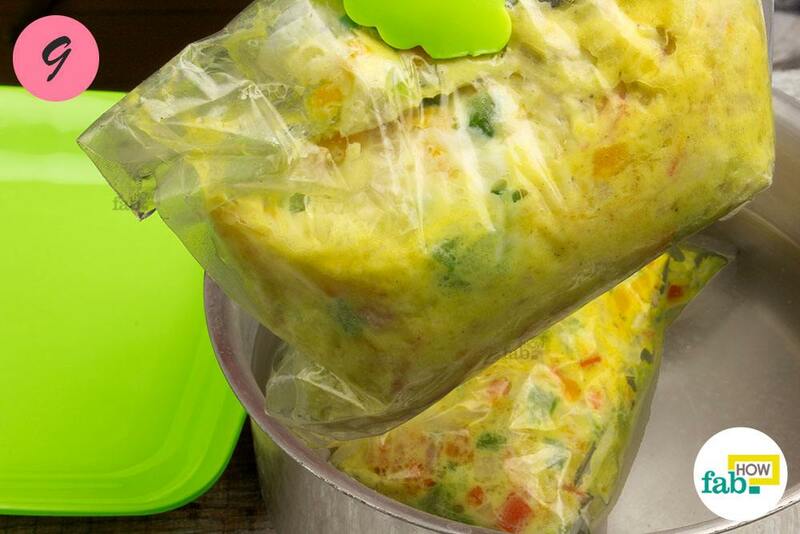 These omelet packets will soon become a favorite with your friends and family. Parsley, basil and chives go very well for garnishing, while dill can even be used in the filling. Experimenting with herbs can make your vegetable omelet unique in taste and make you stand out in a crowd. If you’re not using a nonstick skillet, compensate with liberal use of butter. 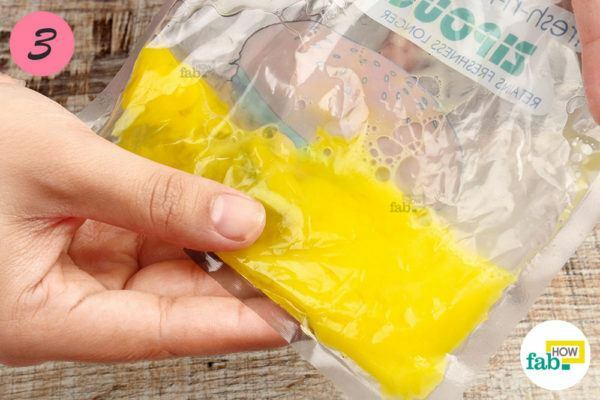 If there is any air trapped in the Ziploc bag after sealing it, you might face difficulty while beating the egg. The egg may elude your grasp due to the trapped air. While boiling, water may rush into the Ziploc bag. 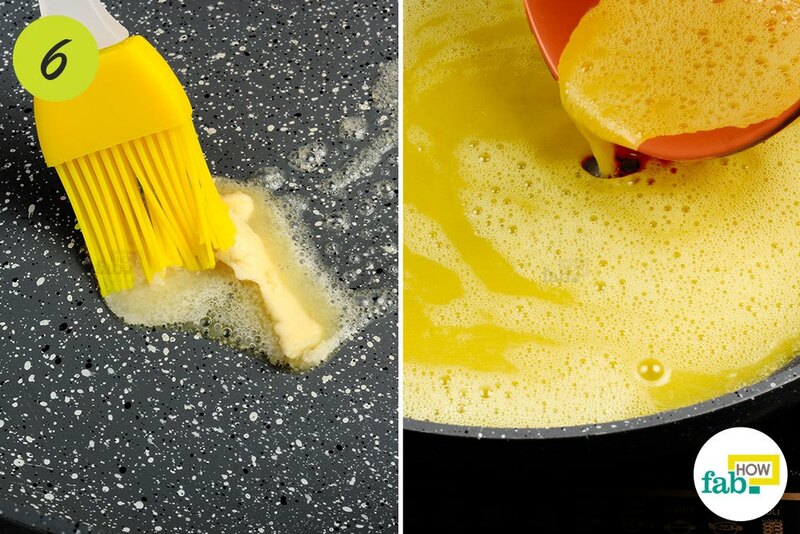 Your omelet may split or tear as a result. Handle hot Ziploc bags with caution. For good measure, let them sit on a plate for a minute before you open them. 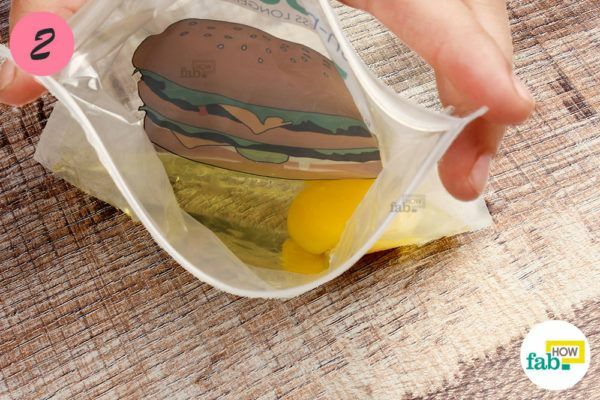 At most, 2 eggs can be cooked in a sandwich-sized Ziploc bag, provided that you don’t add any veggies. Overstuffing the bags can lead to uneven cooking.